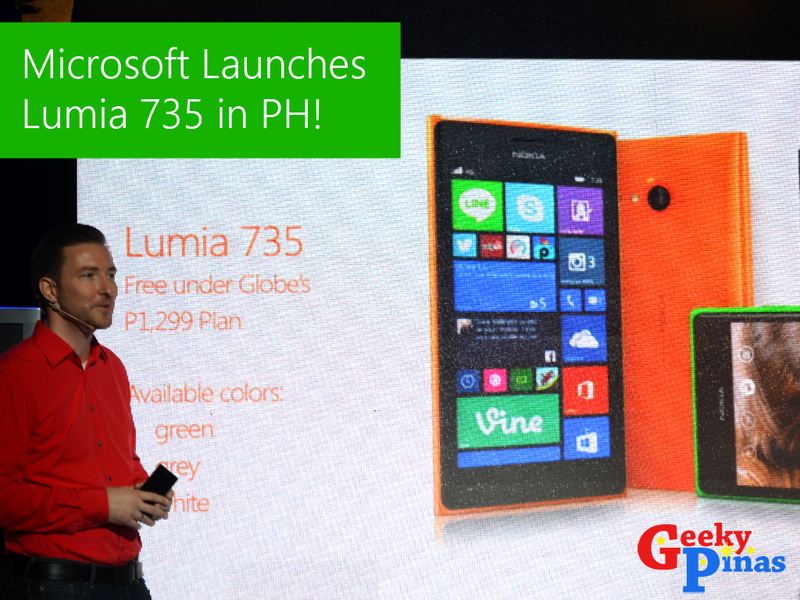 Microsoft Lumia 735 Officially Launches In The Philippines! Along with the Lumia 535, Microsoft also officially launches the Lumia 735 in the Philippines. The Lumia 735 sports a 4.7-inch HD OLED Display and is powered by 1.2GHz Qualcomm Snapgdragon 400 quad-core processor. It features 1GB of RAM, 8 GB internal memory expandable up to 128GB via microSD, 15GB OneDrive cloud storage, 6.7MP FF ZEISS f1.9 rear camera, Full HD 5 MP wide angle front camera, 2220 mAh battery and Windows Phone 8.1 with Lumia Denim operating system. The Lumia 735 with LTE.4G and wireless charging will be available in the Philippines starting December 19,2014 under Globe's postpaid plan 1499. It comes in green, white and grey color.